Is it just us, or did the latest update to the iPhone just kill our battery’s stamina? You won’t want to miss out on all of the opportunities to snap, Instagram, or go live on Facebook just because your phone battery died. Throw an external battery pack in your purse or pocket (don’t forget to charge it first!) so your phone stays in the green and you can continue documenting your amazing Vegas trip without missing a single neon-lit selfie. 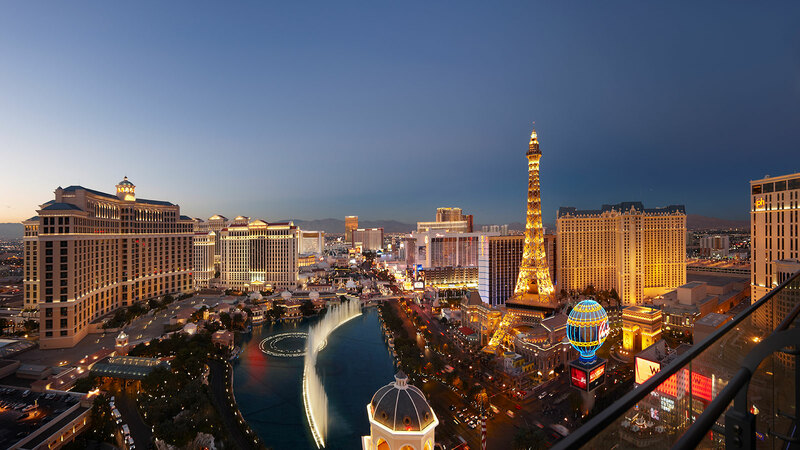 It isn’t just that crying baby on the plane that you want to drown out—Vegas can be a noisy place. At night, it’s easy to hear the thumping bass and general merriness from the bars and clubs permeate the quiet. Or, the loud whispers (ha!) of people making their way down the hall to return to their rooms in the wee hours of the morning. Noise-cancelling headphones will be your best friend. Promise. Vegas is a town filled with well-dressed folk. You may want to dress super sleek, and that’s cool. We get it. But, let’s be real: it’s a trek simply to get from the front desk to your hotel room, let alone the walking you’re going to do once you’re here. Wear sensible footwear. Ladies, don’t rock the massive heels unless you’re stashing some ballet flats in your purse for later. Trust us—you won’t want to walk barefoot down the sidewalk after a night of partying. Men, dress shoes are a must (most clubs won’t let you in with any riff raff kicks like sneakers), but make sure they’re comfortable. Blisters may only last for a few days, but not being able to walk while you’re here? The worst. Vegas is a tipping town, which means cash is king (also, the slot machines don’t take credit cards…yet). If a purse is too bulky or a thick wallet ruins the perfect fit of your skinny jeans, try a money clip or clutch to stash your cash. You’ll need it for valet—if you’re driving or renting a car—as well as tipping your servers and bartenders, velvet rope sentinels, and basically anyone else whose services improve with a little green grease. It’s easy to get caught up in the Las Vegas life and head from pool to dinner to party. Which means you need the all-important transition item in your wardrobe to be as ready to go to the pool as you are to the club. Men, that’s most likely a suit jacket or collared shirt. Make sure to have a pair of dressy shoes to switch up from your dayclub flip-flops. Women, dress up with a pair of (sensible) heels or dressier flats. For a night out, trade in your cute shorts for a pair of skinny black pants or a skirt. And, it never hurts to doll up an outfit with some bling. Take a cue from what’s in style this season and pile on the jewelry to dress up your look. Never underestimate the power of air conditioning in the summer months or the chillier desert winter Vegas can treat you to. A long sleeve jacket is important so you don’t freeze while you’re eating. Even if it is the middle of summer. Remember, Vegas is a desert. Skin gets dry. Like, drier than your skin has likely ever been unless you live in a different desert. A good moisturizer is key to keep that skin luscious and soft. Apply it after the shower. Before you leave your room. While you are out and about. All the time. Start Discussion *Do you have Accessible Parking?